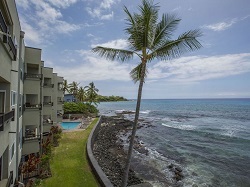 Hawaii condo, beach resort home in Big Island Imagine - warm tropical climate, gentle sounds of waves washing ashore, palm trees swaying in the breeze, panoramic views, comfortable accommodations - is there any other way to experience Hawaii? You can't get much closer to the ocean, and this one is as close as it gets, the view is Awesome!! . People comment that they feel like they are on a boat !! Watch whales, turtles, dolphins, and surfers from your own private 400 square foot lanai only 20 feet off the ocean. Prepare meals as often or as little as you like in the fully-equipped kitchen, which includes a washer/dryer too. Take a dip in the ocean view swimming pool or relax in the Jacuzzi. This is the perfect location close to downtown Kona, as well as the Keauhou shopping center. Third floor unit ( yes there is an elevator) Unit includes free wifi- free phone service-free covered assigned parking- all of the home and beach amenities you will need. Banyan Beach Condo Rental in the Islands of Hawaii. Life on the Big Island of Hawaii is a little more laid-back… and that is exactly how locals like it. The natural beauty and ecological features of Hawaii are a draw for nature lovers and outdoor enthusiasts. Test your nerve at Hawaii Volcanoes National Park, home to the longest volcanic eruption in recorded history, or climb to the indescribably beautiful summit of Mauna Kea. I's huge, Hawaii Island is the youngest and largest island in the Hawaiian chain, but it’s remarkable for more than just its size. Picture yourself visiting Kilauea, one of the most active volcanoes in the world, or talk story with a cultural demonstrator at Puuhonua o Honaunau, a historic park that was once a place of refuge. Whether you’re walking on a black-sand beach, snorkeling with manta rays, horseback riding in Waimea or sailing along the Kona Coast - Hawaii, the Big Island is the island of adventure.